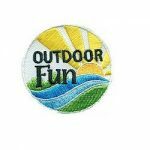 Kit may be made in silver or gold pins based on availability. Wrap a pipe cleaner around your finger so it has a swirl shape. Slide off your finger. 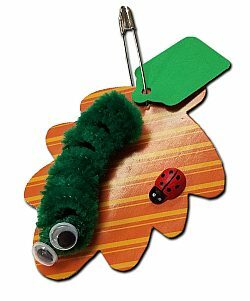 Use glue dots and glue two eyes onto the caterpillar. Adhere the caterpillar to the leaf. 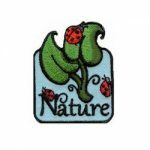 Peel and stick the wooden lady bug to the leaf. Poke a hole through the leaf with the pin and slide it on. If you are using optional SWAP* tags, write your message on the tag and slide onto the pin. Close pin. 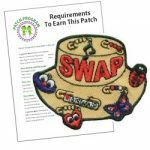 3 reviews for "Caterpillar Kit for Swapping"
I run a cub scout Day & Evening camps each summer and always looking for crafts that boys (6 to 11 year olds) would feel like completing and can be done in 30 minutes with a little help from our jr staff (teens). during the day the science staff worked with the scouts, kids liked them, but the staff had issues. Crafts team used hot glue guns and was very successful in getting all the boys to complete theirs. Eyes and lady bug are not peel and stick, so a hot glue gun is a must! very affordable and nice craft for the cost.